The item in the floor in front of the chair looks like wooden knife called a scutching knife. It is used in the process of flax into linen. Where a wooden knife was used to scrape off pieces of core still clinging to the flax fiber. It is used with a swinging board. Thank You! I added it to the detail. 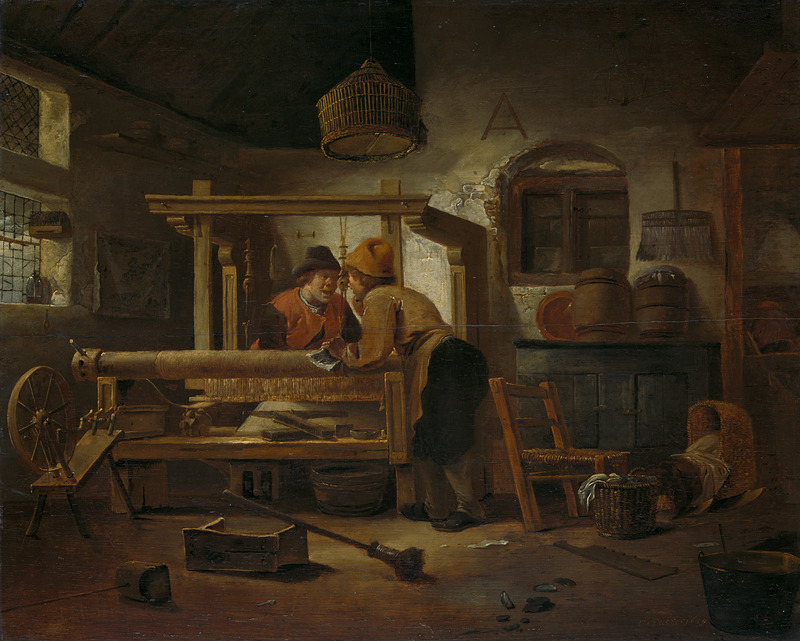 After looking at the two Cornelis Decker pictures here, I am wondering if the “mop” isn’t used to keep the warp damp. It seems to short of brush to do much on a floor. Must be used for a smaller area. The other painting also had one near the loom and the tub under the loom. So if weaving linen, they could be keeping the warp damp as linen is stronger damp than dry and under the tension of a loom that was often done. I am thinking aloud here. Need some more research.